French orbital launch vehicle. In December 1961 France decided to demonstrate an indigenous satellite-launch capability, using stages in development for its ballistic missile program. Following careful evolutionary development, Diamant was successful on its first attempt in 1965. Improved versions were flown over the next ten years. 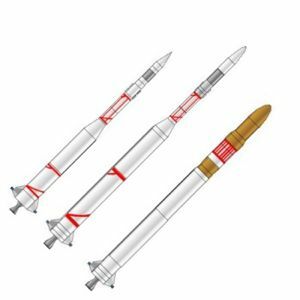 Although France abandoned the planned ICBM for the solid-propellant SSBS, Diamant technology was used in the European Europa and Ariane launch vehicles. Emeraude VE121 Emeraude was a step toward larger liquid propellant launch vehicles, building on the Veronique and Vesta experience. It burned 12.8 metric tons nitric acid/turpentine pressure-fed propellants in 91 seconds. The engine was gimbaled for pitch and yaw control, with aerodynamic fins controlling roll. In anticipation of the next step, Saphir, a dummy Topaze stage topped the vehicle to confirm aerodynamic characteristics. The first three launches were failures due to propellant sloshing. This was remedied in the later tests. Saphir VE231 Saphir was the penultimate step in the 'precious stones' series. The variants of the two-stage vehicle were designed to allow testing of radio-controlled guidance (VE231P), inertial guidance (VE231G), and warhead separation and re-entry of an ablative RV (VE231R). Addition of a third stage would transform Saphir into the Diamant satellite launcher. Diamant A Diamant development could be done relatively quickly using stages and systems being developed for strategic missiles. In May 1962 CNES selected DMA as program manager, with SEREB as the prime contractor. The Diamant orbital launch vehicle was created by replacing the payload of the existing Saphir test vehicle with a new third stage. Prior to any all-up satellite launch attempt the P064 third stage was flight tested on the smaller suborbital Rubis test vehicle. This evolutionary approach paid off. Diamant B As a follow-on to the Diamant-A, CNES decided to evolve a more capable launch vehicle. The Diamant-B used a new first stage with 50% more propellants and 33% more thrust; the same second stage; and a fatter third stage. Six Diamant-B boosters were ordered. Originally four of these were to be used to test the Europa 2 launch vehicle's Perigee-Apogee System. These tests were cancelled and instead CNES used five of the six boosters for orbital attempts. Diamant BP.4 In January 1972 a further evolution, the Diamant BP.4, was authorized. The second stage was replaced with the P4 Rita motor developed for the MSBS SLBM. The larger 1.38 m diameter fairing developed for the British Black Arrow launcher allowed larger payloads to be accommodated. Three launches of the BP.4 in 1975 completed the Diamant saga. Family: orbital launch vehicle. Country: France. Engines: Topaze, Vexin B. Spacecraft: Asterix, D, Diadem, Dial MIKA, DIAL WIKA, Peole, Starlette. Stages: P6. Agency: SEREB. Bibliography: 126, 2, 279, 34, 572, 6. 1965 November 26 - . 14:47 GMT - . Launch Site: Hammaguira. Launch Complex: Hammaguira Brigitte. LV Family: Diamant. Launch Vehicle: Diamant A.
Asterix 1 - . Payload: A 1. Mass: 42 kg (92 lb). Nation: France. Agency: CNES. Class: Technology. Type: Navigation technology satellite. Spacecraft: Asterix. USAF Sat Cat: 1778 . COSPAR: 1965-096A. Apogee: 1,697 km (1,054 mi). Perigee: 527 km (327 mi). Inclination: 34.30 deg. Period: 107.50 min. First French satellite. French scientific satellite 'A-I'. Launched from Hammaguir (Algeria) in rder to test the 'Diamant' launching vehicle for the first time..
1966 February 17 - . 08:33 GMT - . Launch Site: Hammaguira. Launch Complex: Hammaguira Brigitte. LV Family: Diamant. Launch Vehicle: Diamant A.
Diapason - . Payload: D-1A. Mass: 19 kg (41 lb). Nation: France. Agency: CNES. Class: Earth. Type: Geodetic satellite. Spacecraft: D. USAF Sat Cat: 2016 . COSPAR: 1966-013A. Apogee: 2,484 km (1,543 mi). Perigee: 502 km (311 mi). Inclination: 34.10 deg. Period: 115.80 min. Scientific satellite 'D-I' launched from Hammaguir (Algeria)..
1967 February 8 - . 09:39 GMT - . Launch Site: Hammaguira. Launch Complex: Hammaguira Brigitte. LV Family: Diamant. Launch Vehicle: Diamant A. FAILURE: Partial Failure - injected into too low an orbit.. Failed Stage: 3. Diademe 1 - . Payload: Diademe D-1C. Mass: 23 kg (50 lb). Nation: France. Agency: CNES. Class: Earth. Type: Geodetic satellite. Spacecraft: Diadem. USAF Sat Cat: 2674 . COSPAR: 1967-011A. Apogee: 1,084 km (673 mi). Perigee: 545 km (338 mi). Inclination: 40.00 deg. Period: 101.20 min. Orbit too low. Launch time of Diadem I was 10:39:40 on 8 Feb 1967. Launch time of Diadem II was 11:06:57 on 15 Feb 1967..
1967 February 15 - . 10:06 GMT - . Launch Site: Hammaguira. Launch Complex: Hammaguira Brigitte. LV Family: Diamant. Launch Vehicle: Diamant A.
Diademe 2 - . Payload: Diademe D-1D. Mass: 23 kg (50 lb). Nation: France. Agency: CNES. Class: Earth. Type: Geodetic satellite. Spacecraft: Diadem. USAF Sat Cat: 2680 . COSPAR: 1967-014A. Apogee: 1,733 km (1,076 mi). Perigee: 584 km (362 mi). Inclination: 39.40 deg. Period: 108.50 min. Launch time of Diadem I was 10:39:40 on 8 Feb 1967. Launch time of Diadem II was 11:06:57 on 15 Feb 1967. .
1975 February 6 - . 16:35 GMT - . Launch Site: Kourou. Launch Complex: Kourou Diamant. LV Family: Diamant. Launch Vehicle: Diamant BP.4. Starlette - . Payload: Starlette (BETA). Mass: 47 kg (103 lb). Nation: France. Agency: CNES. Class: Earth. Type: Geodetic satellite. Spacecraft: Starlette. USAF Sat Cat: 7646 . COSPAR: 1975-010A. Apogee: 1,108 km (688 mi). Perigee: 805 km (500 mi). Inclination: 49.80 deg. Period: 104.20 min. Geodesic satellite. .
1975 May 17 - . 10:32 GMT - . Launch Site: Kourou. Launch Complex: Kourou Diamant. LV Family: Diamant. Launch Vehicle: Diamant BP.4. Pollux - . Payload: D-5A. Mass: 35 kg (77 lb). Nation: France. Agency: CNES. Class: Earth. Type: Geodetic satellite. Spacecraft: D. Decay Date: 1975-08-05 . USAF Sat Cat: 7801 . COSPAR: 1975-039A. Apogee: 1,256 km (780 mi). Perigee: 299 km (185 mi). Inclination: 30.00 deg. Period: 100.40 min. D5A: Weight 36 kg. Testing in space of a hydrazine catalytic decomposition micropropulsion unit. Responsible organization: Societe Europeene de Propulsion. D5B: Weight 76 kg. Testing in space of the CACTUS accelerometer (ultrasensitive triaxial capacitive accelerometric sensor). Responsible organization: ONERA, Chatillon-sous-Berneux, France. Castor - . Payload: D-5B. Mass: 77 kg (169 lb). Nation: France. Agency: CNES. Class: Earth. Type: Geodetic satellite. Spacecraft: D. Decay Date: 1979-02-18 . USAF Sat Cat: 7802 . COSPAR: 1975-039B. Apogee: 1,275 km (792 mi). Perigee: 277 km (172 mi). Inclination: 29.90 deg. Period: 100.30 min. 1975 September 27 - . 08:37 GMT - . Launch Site: Kourou. Launch Complex: Kourou Diamant. LV Family: Diamant. Launch Vehicle: Diamant BP.4. Aura - . Payload: D-2. Mass: 115 kg (253 lb). Nation: France. Agency: CNES. Class: Earth. Type: Geodetic satellite. Spacecraft: D. Decay Date: 1982-09-30 . USAF Sat Cat: 8332 . COSPAR: 1975-092A. Apogee: 697 km (433 mi). Perigee: 476 km (295 mi). Inclination: 37.10 deg. Period: 96.50 min. Solar UV radiation experiments. Study of solar and stellar ultraviolet radiation. 1. Spectral analysis of small and large sources located close to the plane of the ecliptic. Responsible organization: Laboratoire d'Astronomie Spatiale, Traverse du Siphon, 13000- Marseille (France). 2. St udy of solar ultraviolet radiation and its absorption by the earth's atmosphere. Responsible organization: Laboratoire de Physique Stellaire et Planetaire, Meudon, France. Weight 106.6 kg.